© 2011 ONYX Graphics, Inc. 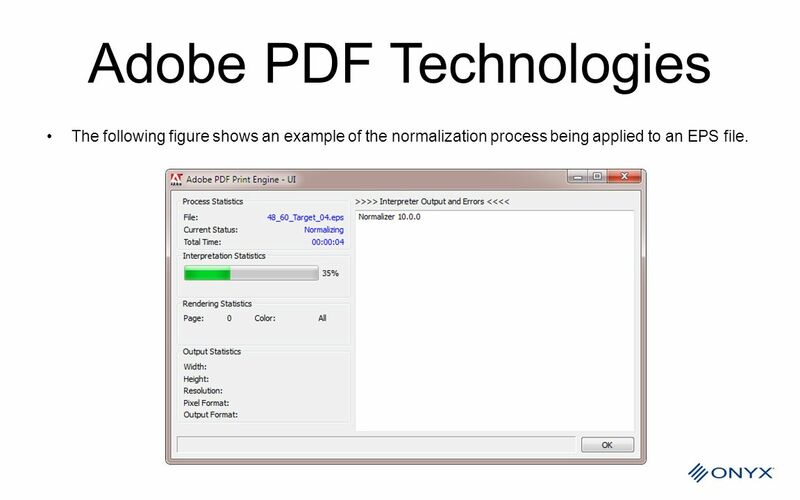 The following figure shows an example of the normalization process being applied to an EPS file. 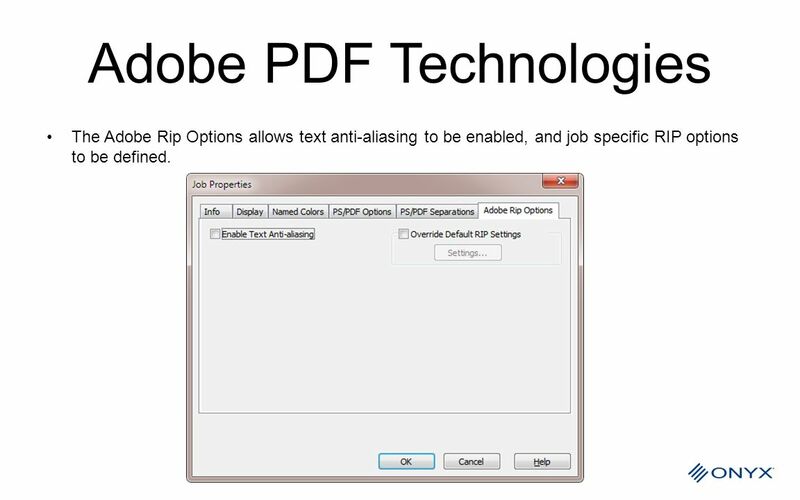 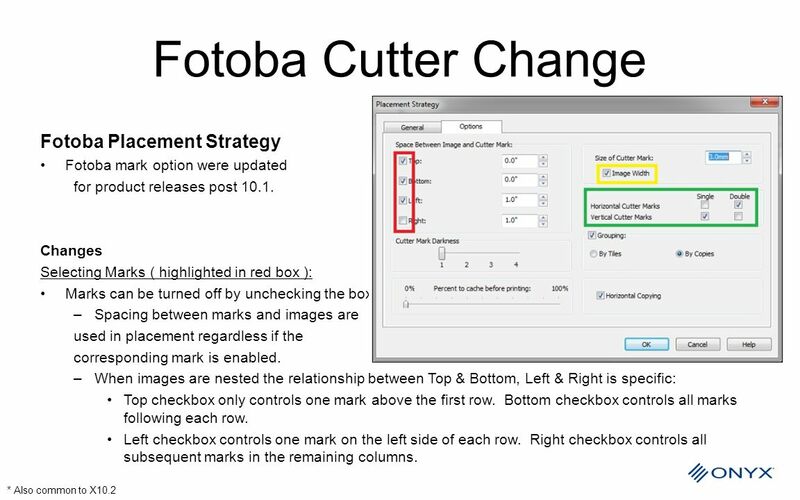 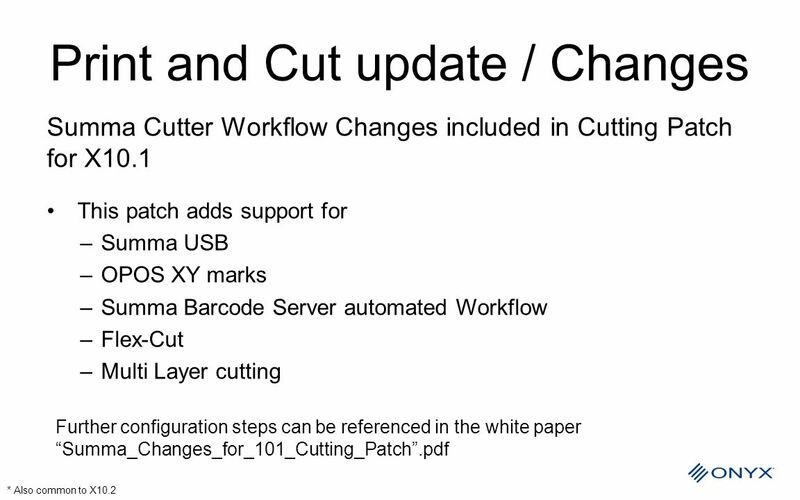 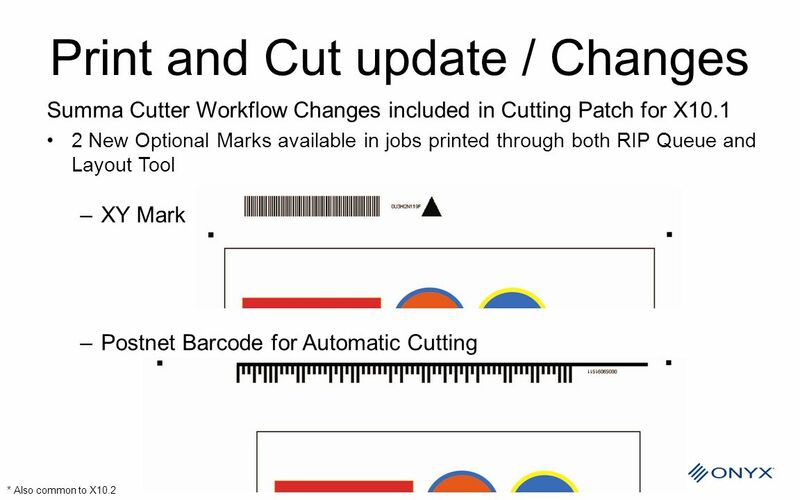 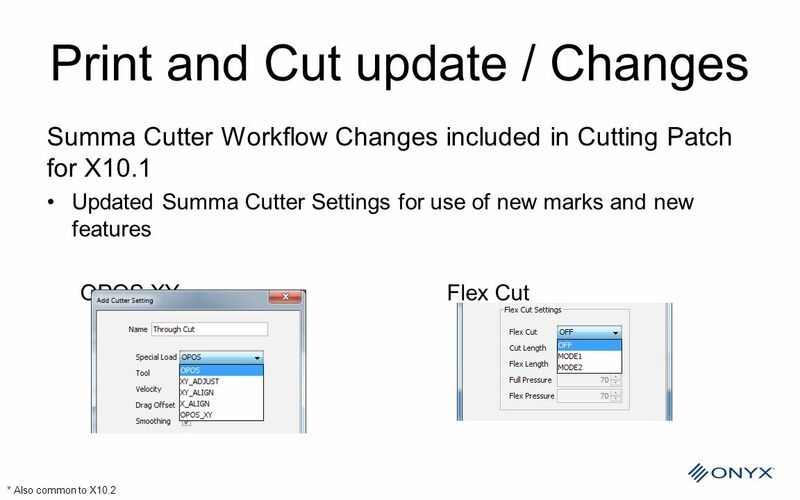 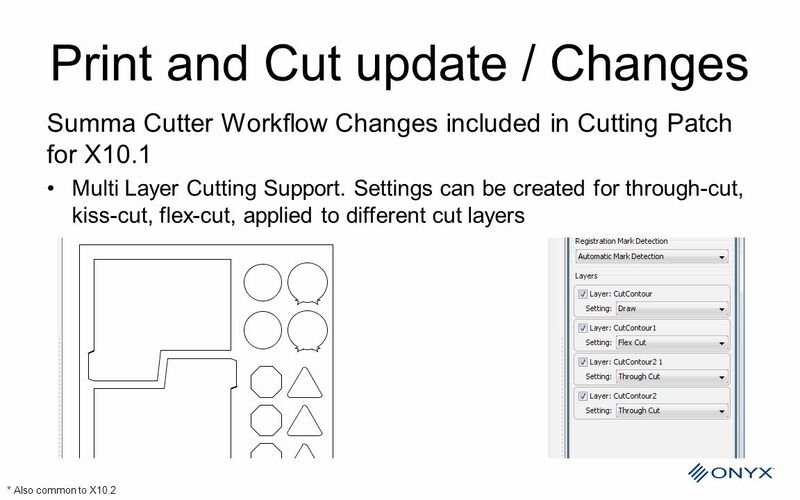 The Adobe Rip Options allows text anti-aliasing to be enabled, and job specific RIP options to be defined. 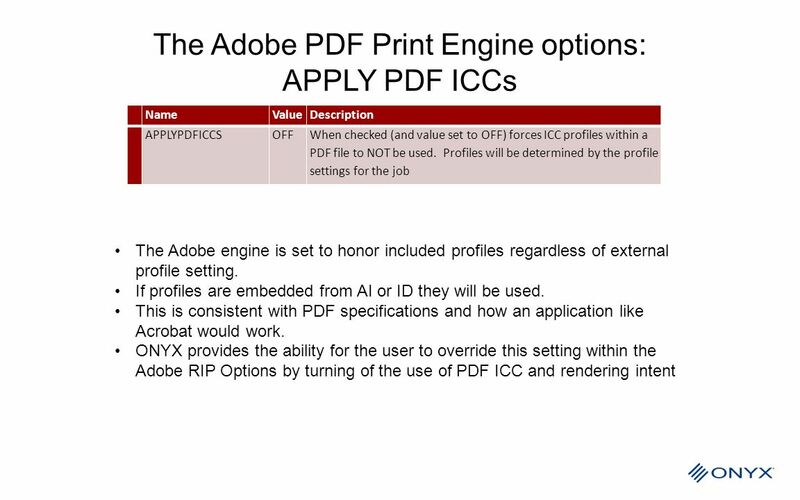 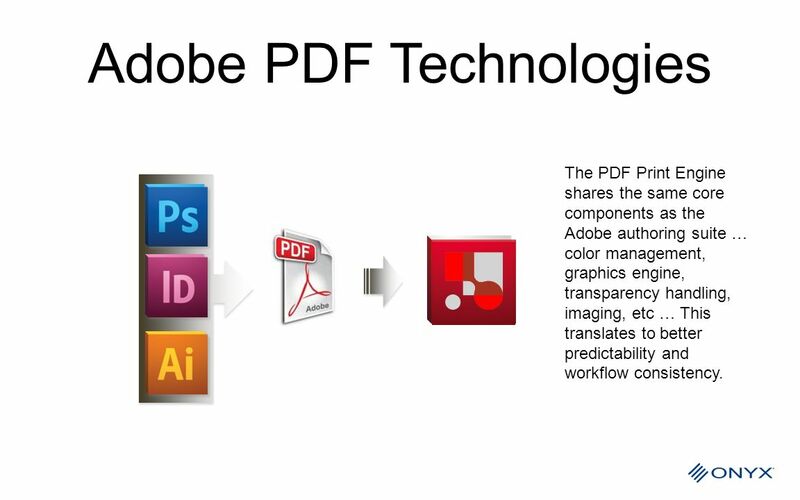 Name Value Description APPLYPDFICCS OFF When checked (and value set to OFF) forces ICC profiles within a PDF file to NOT be used. 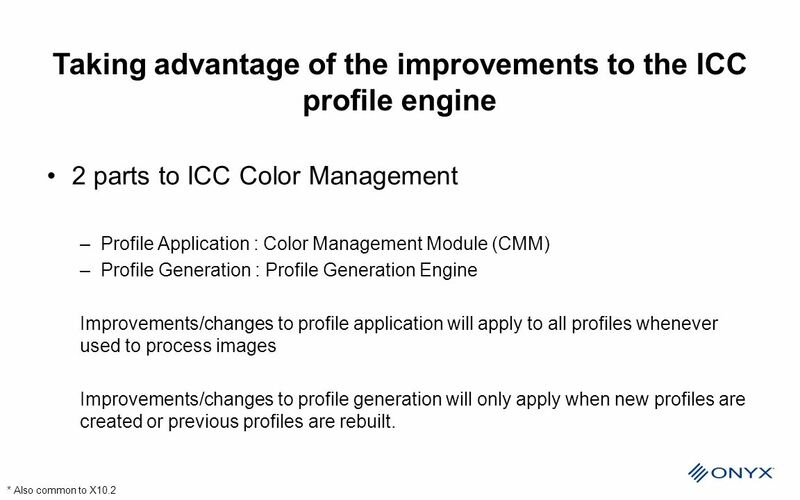 Profiles will be determined by the profile settings for the job COMPATMODE CMYK When checked this forces the file to be rendered first as a CMYK contone image. 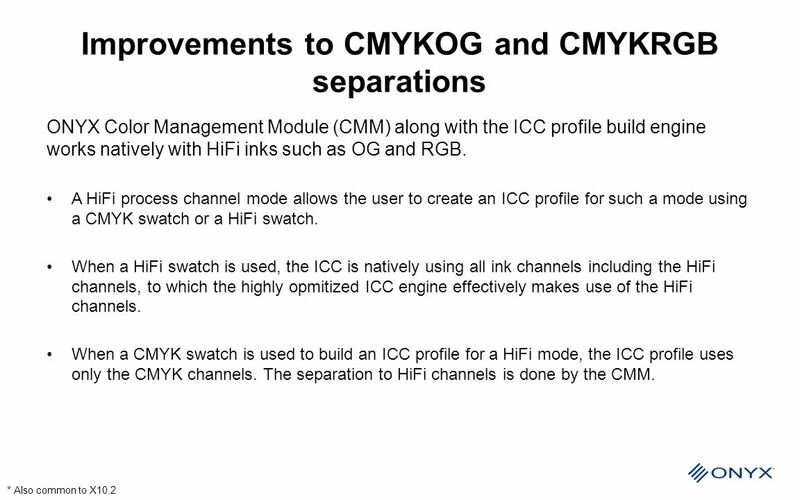 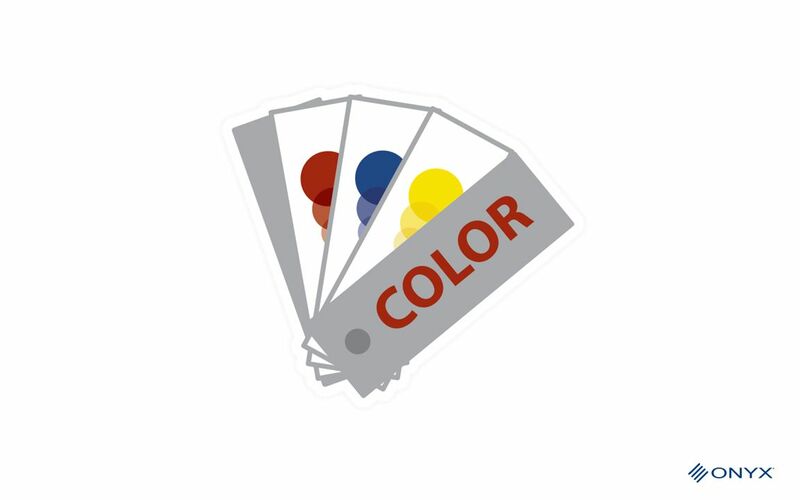 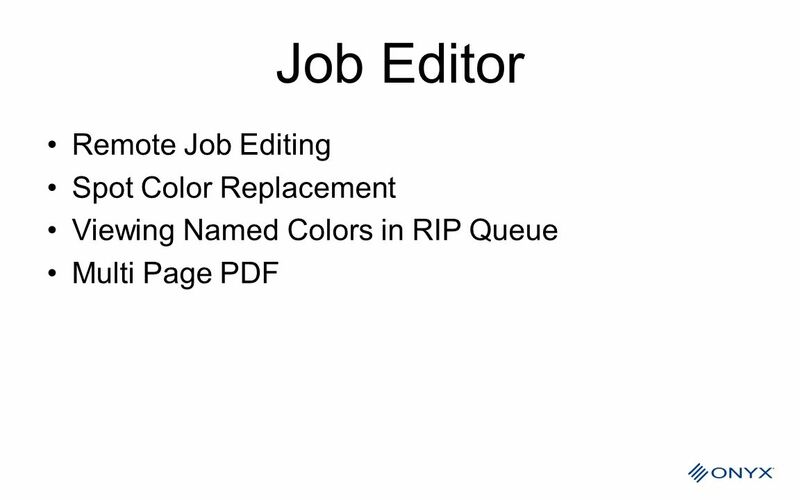 Then the CMYK image profile in the job settings will be used to convert to the final output. 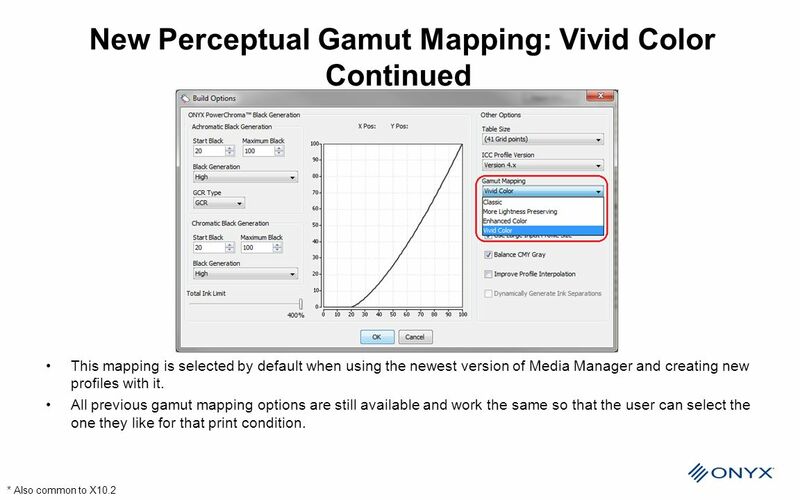 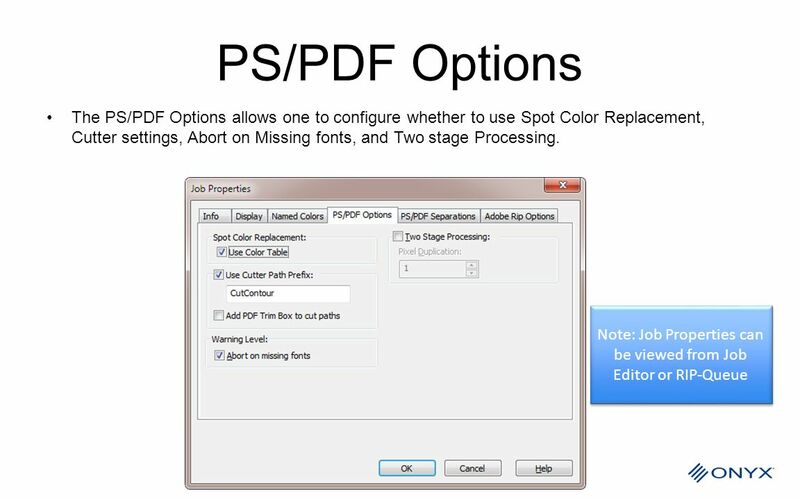 EMULATEOVERPRINT NO By default overprint behavior of spots and process colors is emulated. 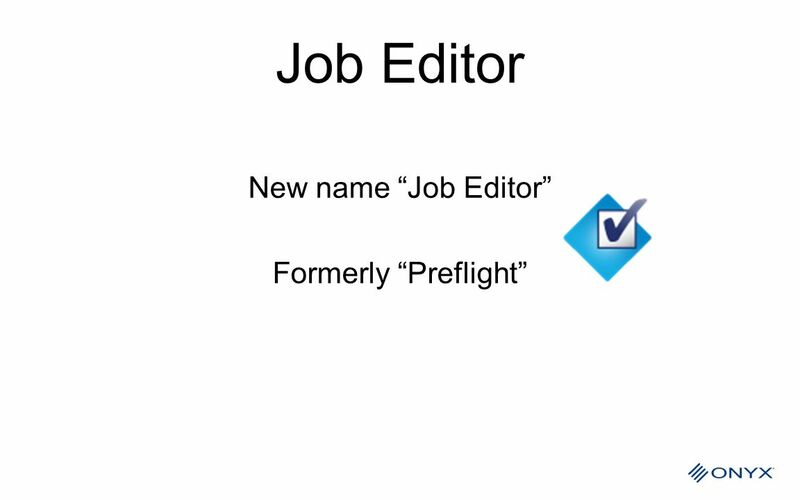 Checking this turns off this feature. 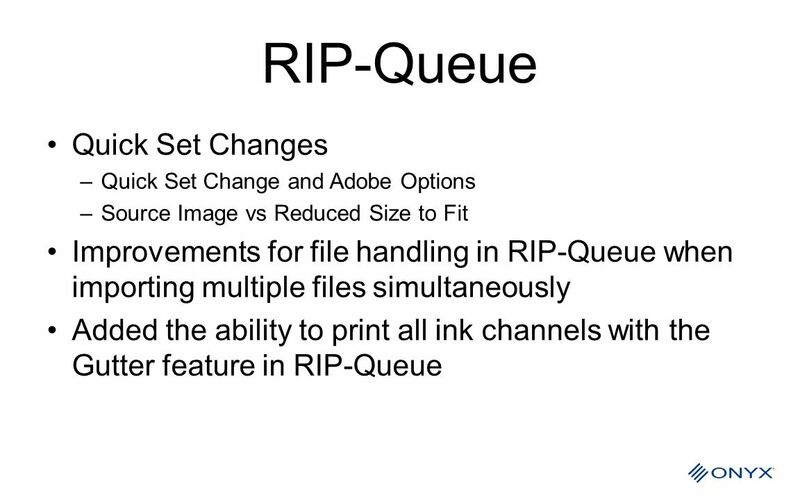 ENDPAUSE 10000 This causes the program to pause at the end of ripping. 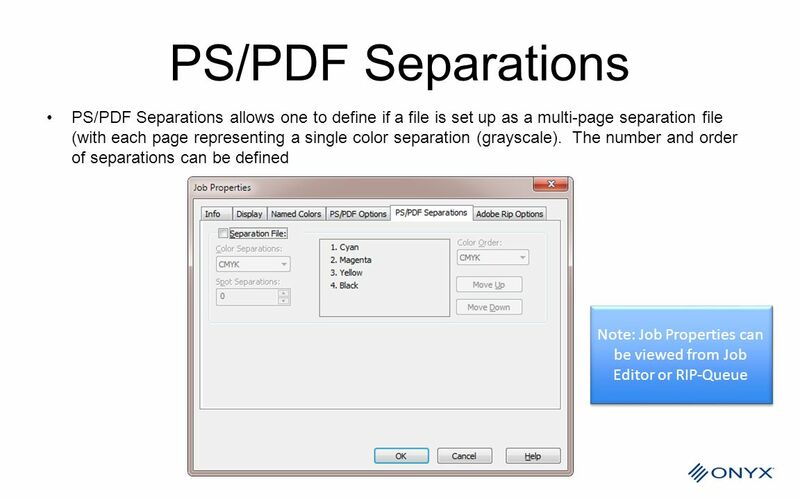 The total time is in milliseconds. 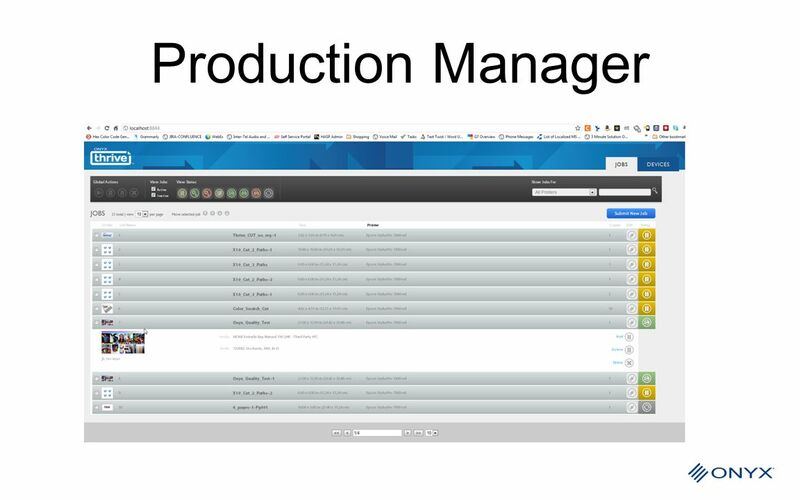 The value of results in a 10 second pause. 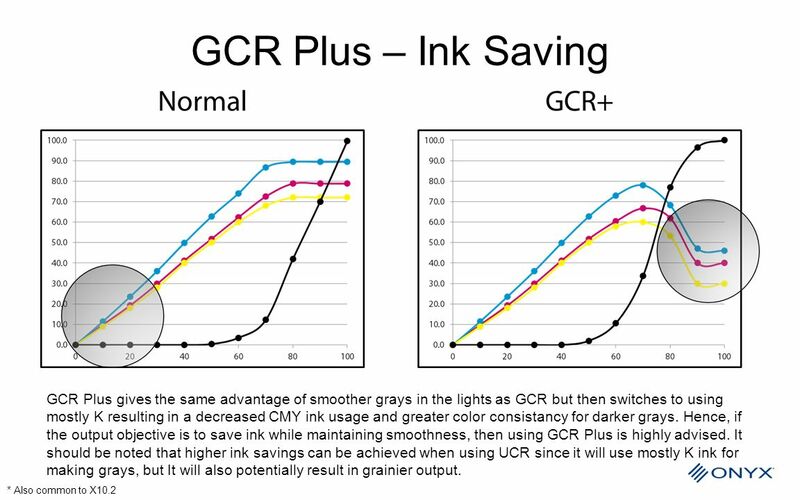 IGNOREPDLALLBLENDSPACES Normally Transparency blending is performed using a CMYK working space. 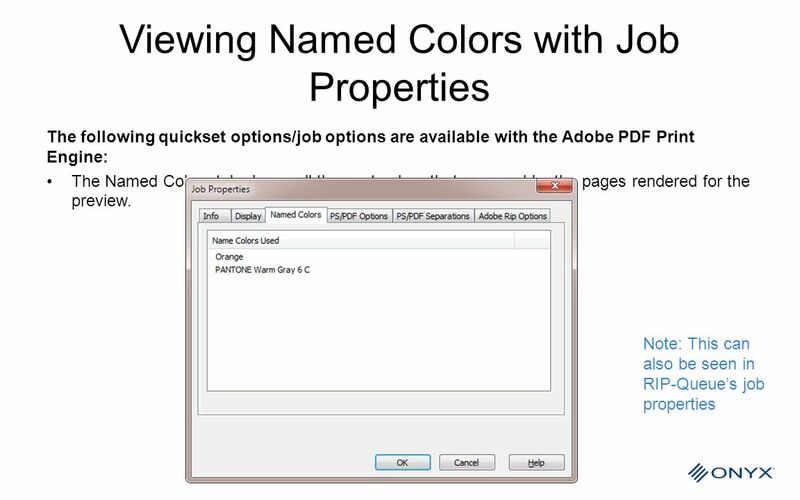 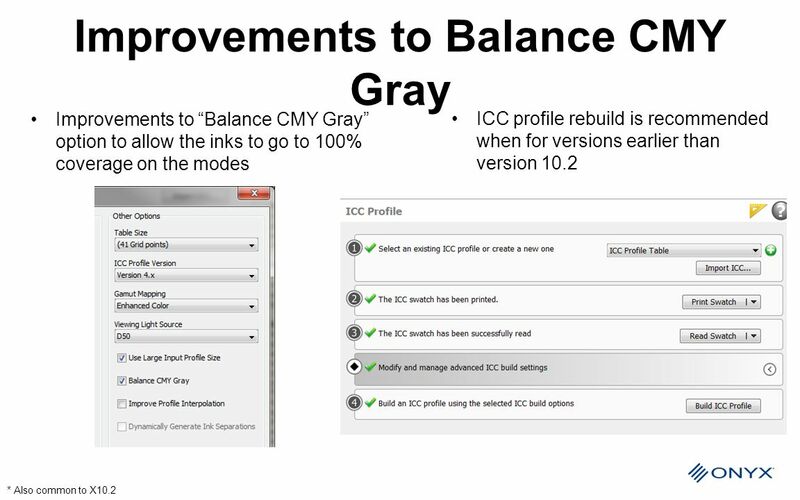 Checking this allows blending to be performed using other color spaces. 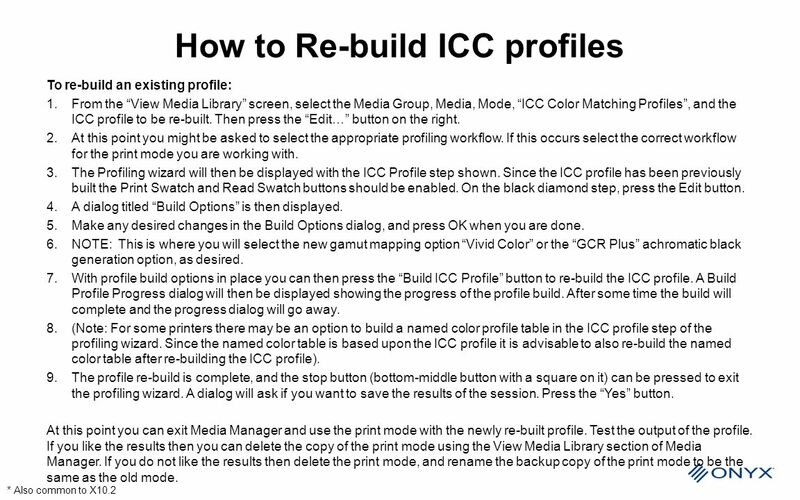 (Note: It is NOT recommended to check this as doing so may result in profiles not being applied to some objects). 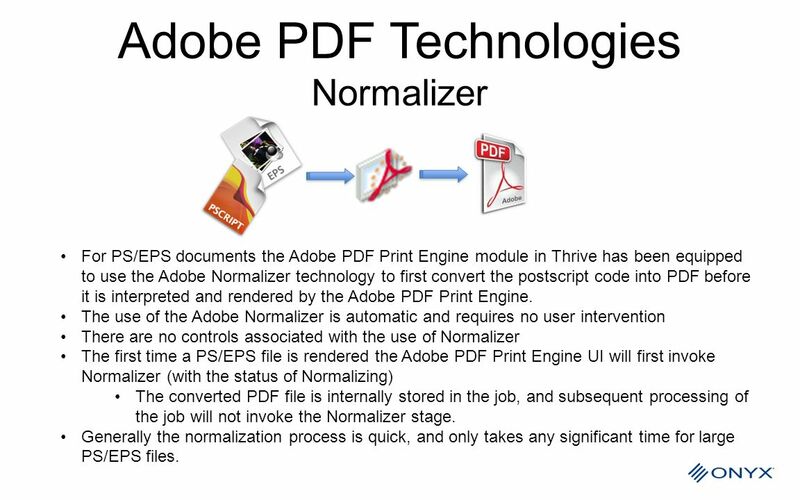 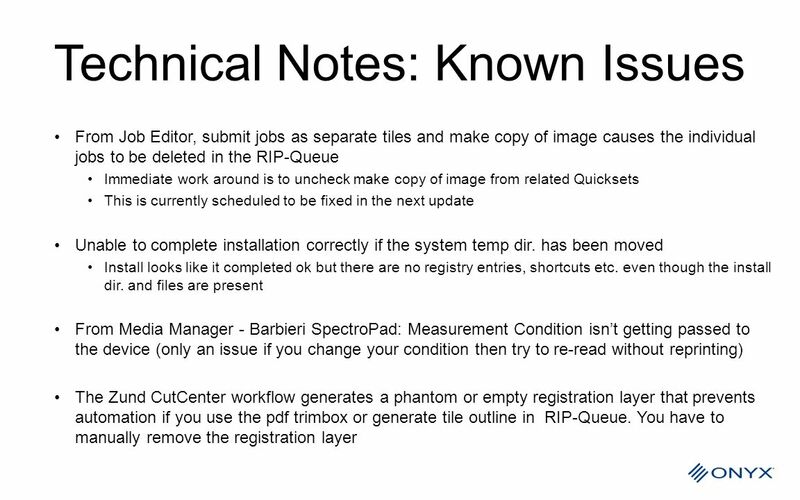 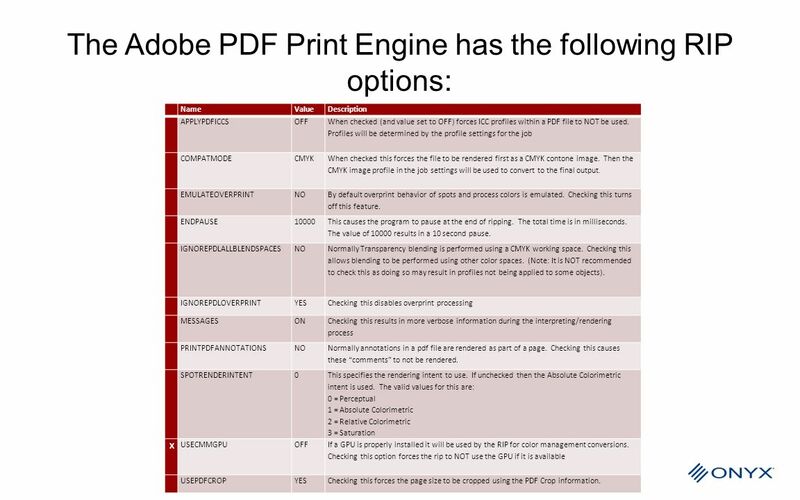 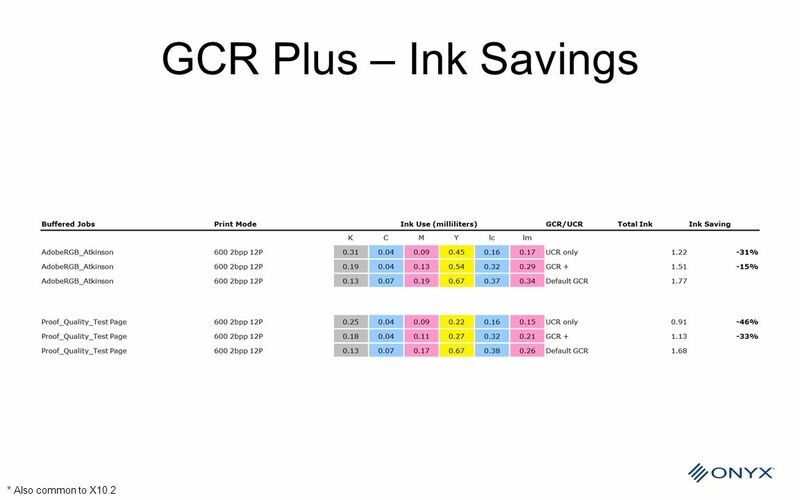 IGNOREPDLOVERPRINT YES Checking this disables overprint processing MESSAGES ON Checking this results in more verbose information during the interpreting/rendering process PRINTPDFANNOTATIONS Normally annotations in a pdf file are rendered as part of a page. 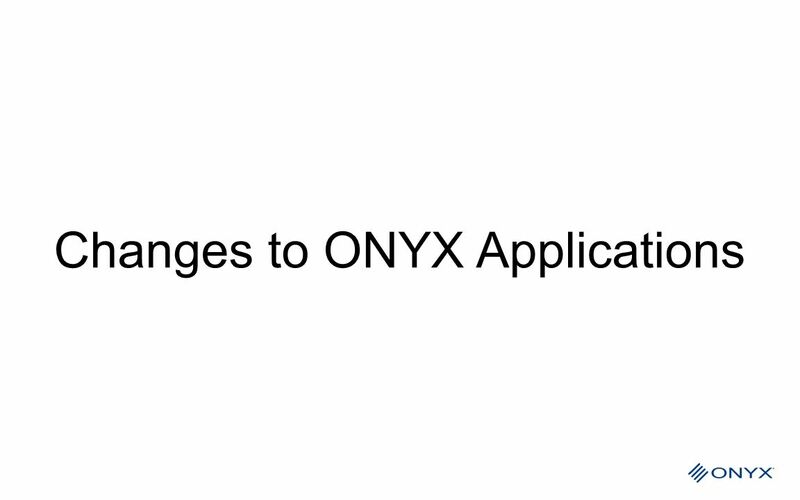 Checking this causes these “comments” to not be rendered. 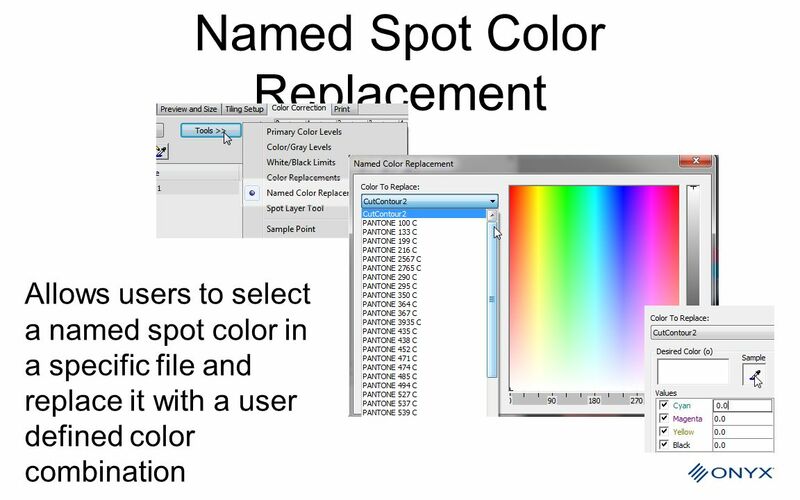 SPOTRENDERINTENT This specifies the rendering intent to use. 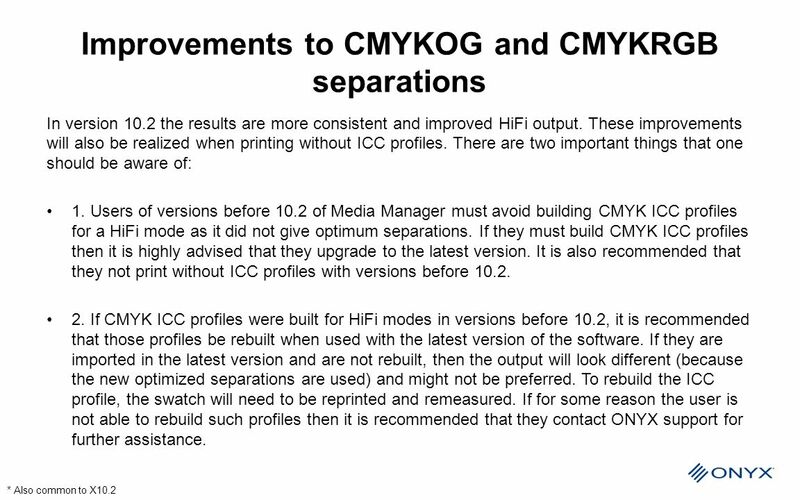 If unchecked then the Absolute Colorimetric intent is used. 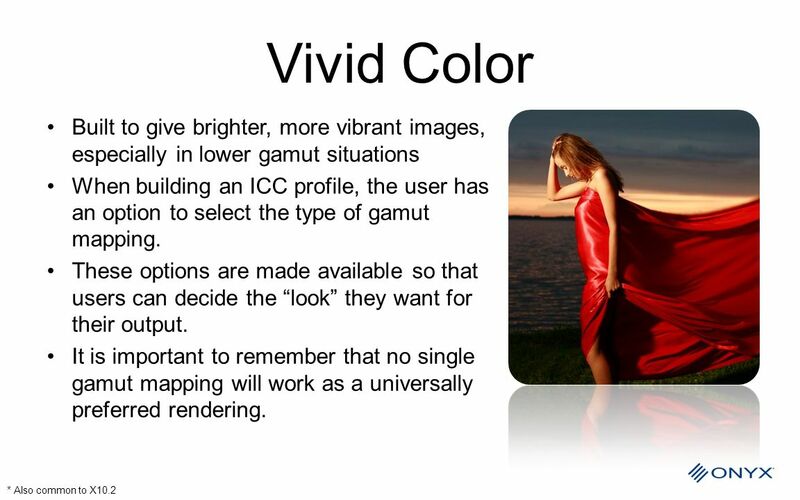 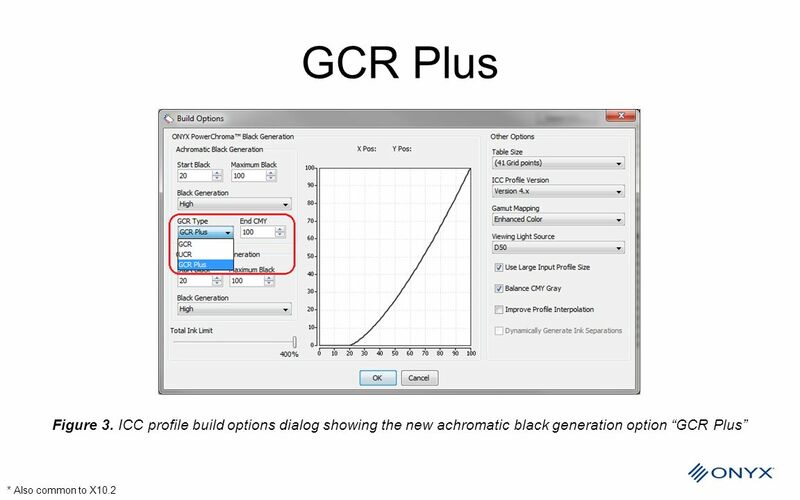 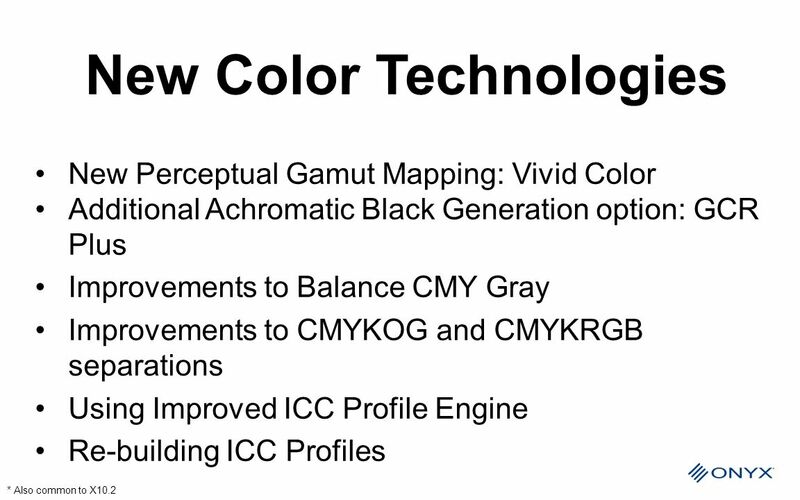 The valid values for this are: 0 = Perceptual 1 = Absolute Colorimetric 2 = Relative Colorimetric 3 = Saturation X USECMMGPU If a GPU is properly installed it will be used by the RIP for color management conversions. 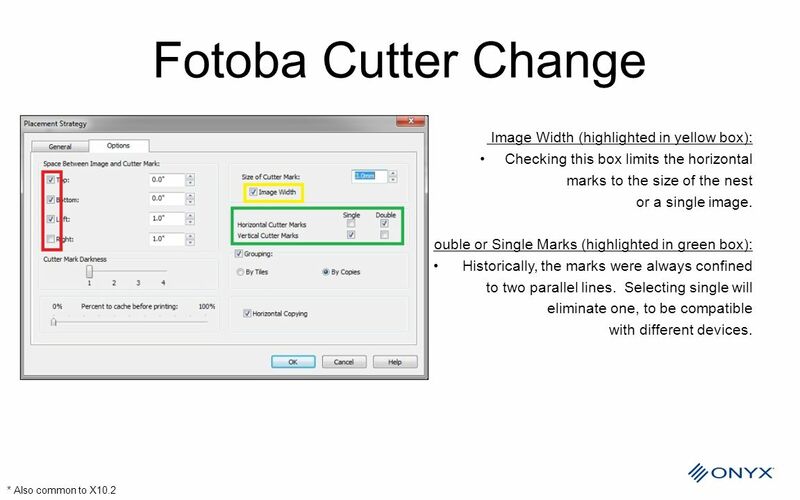 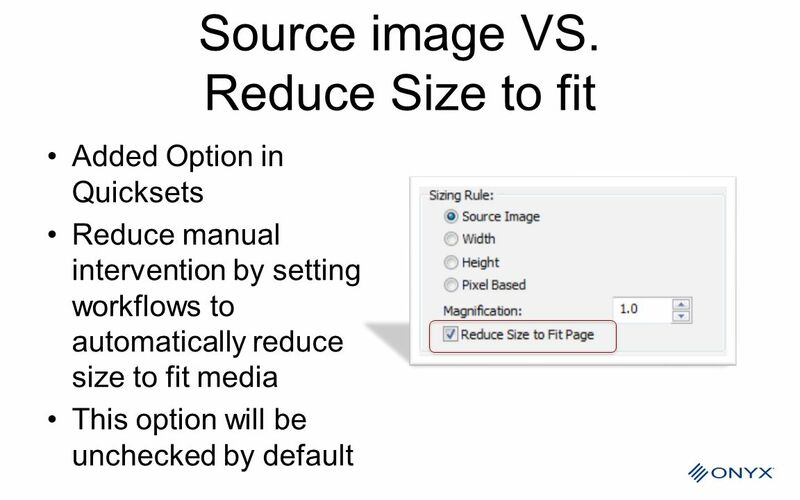 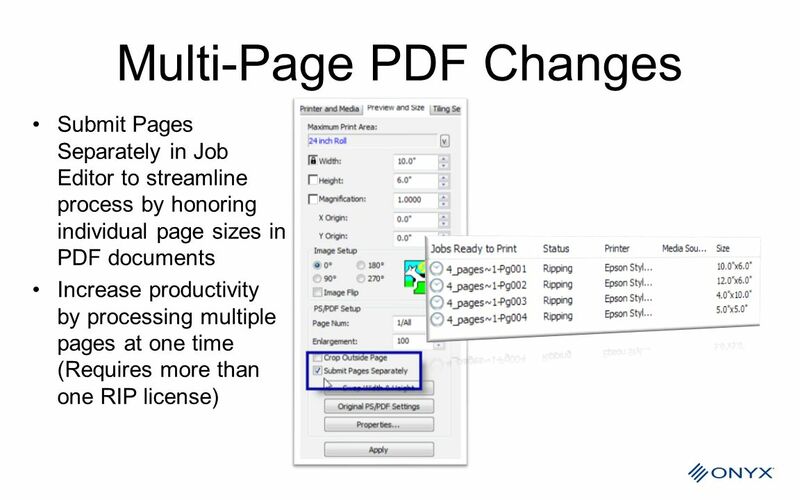 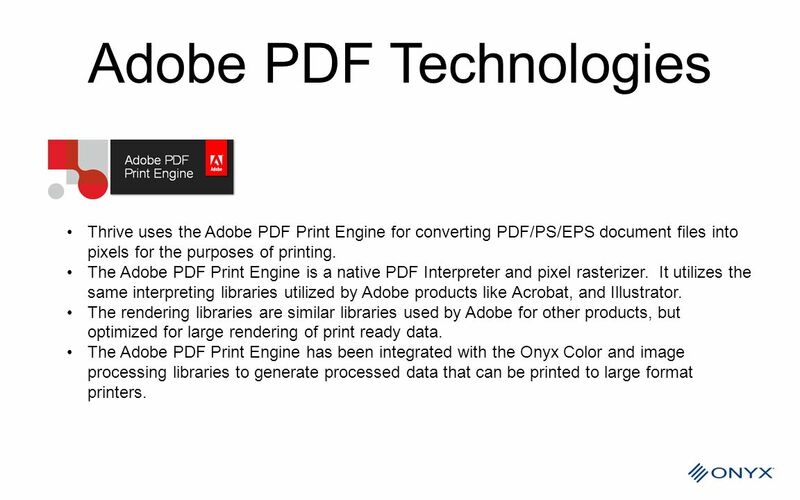 Checking this option forces the rip to NOT use the GPU if it is available USEPDFCROP Checking this forces the page size to be cropped using the PDF Crop information. 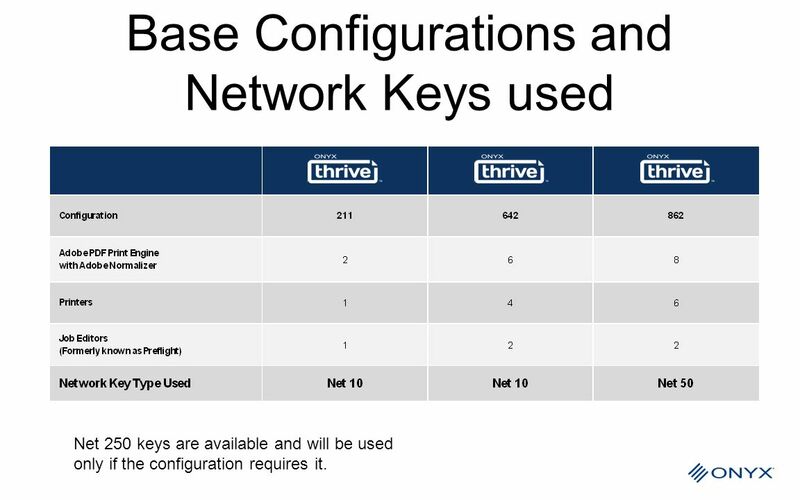 Net 250 keys are available and will be used only if the configuration requires it. 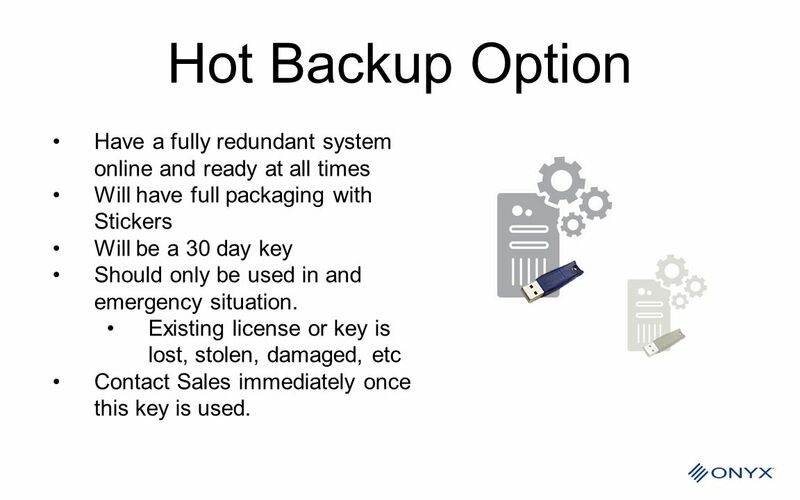 14 Hot Backup Option Have a fully redundant system online and ready at all times Will have full packaging with Stickers Will be a 30 day key Should only be used in and emergency situation. 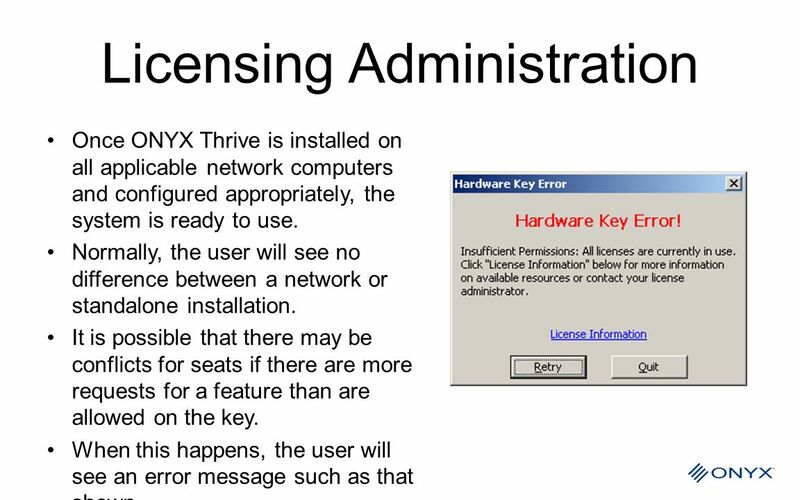 Existing license or key is lost, stolen, damaged, etc Contact Sales immediately once this key is used. 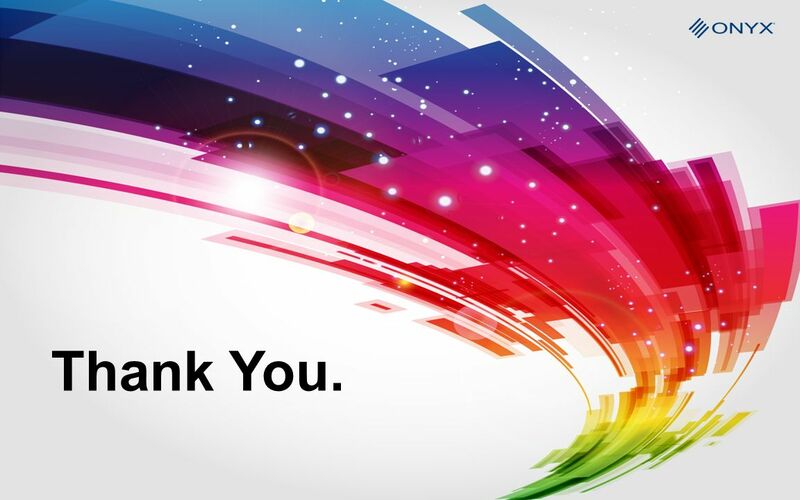 19 This is what you are used to! 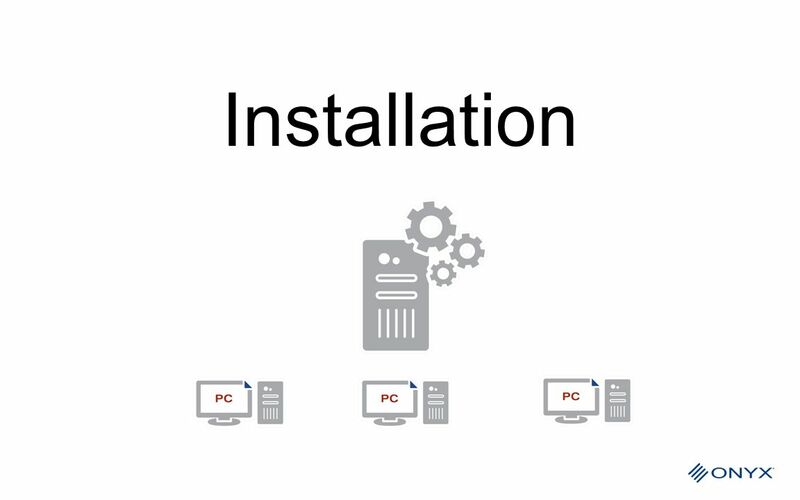 Complete Install This is what you are used to! 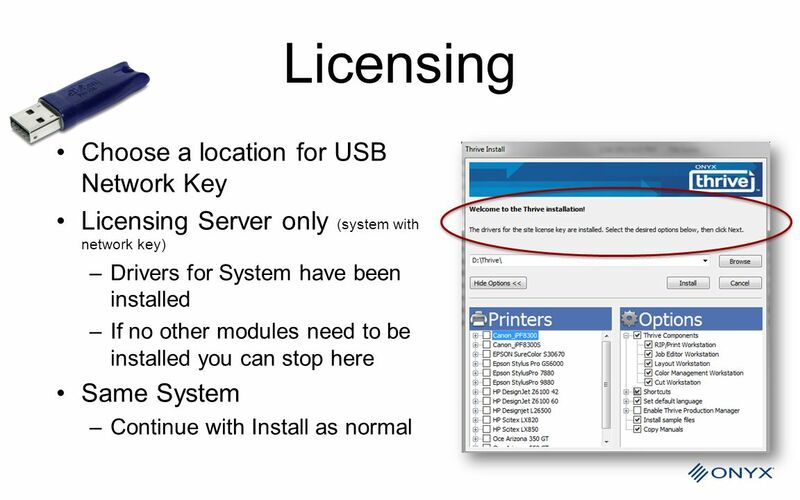 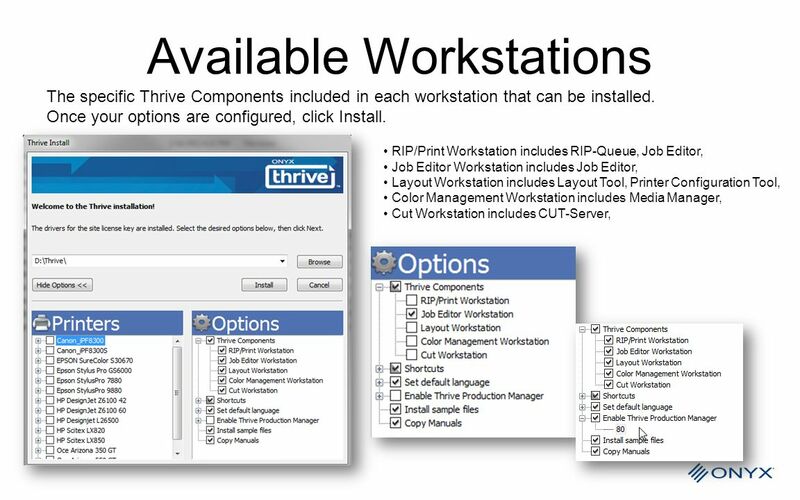 The administrator must ensure that all workstations in the printing workflow on the network can access the server with the key. 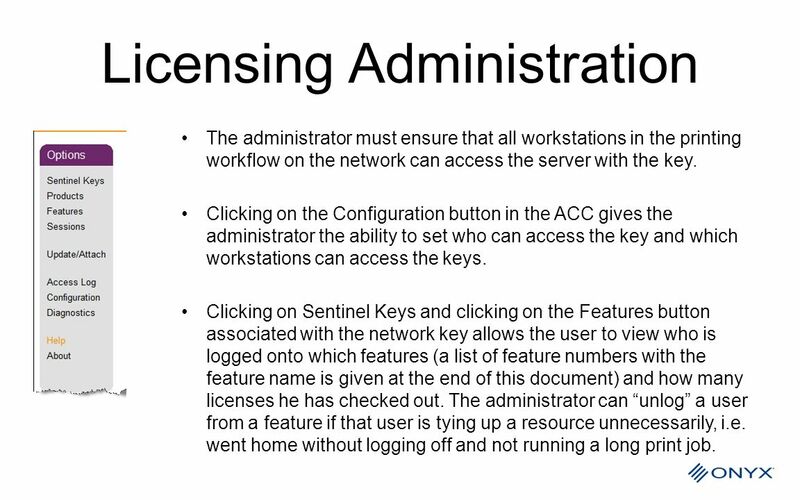 Clicking on the Configuration button in the ACC gives the administrator the ability to set who can access the key and which workstations can access the keys. 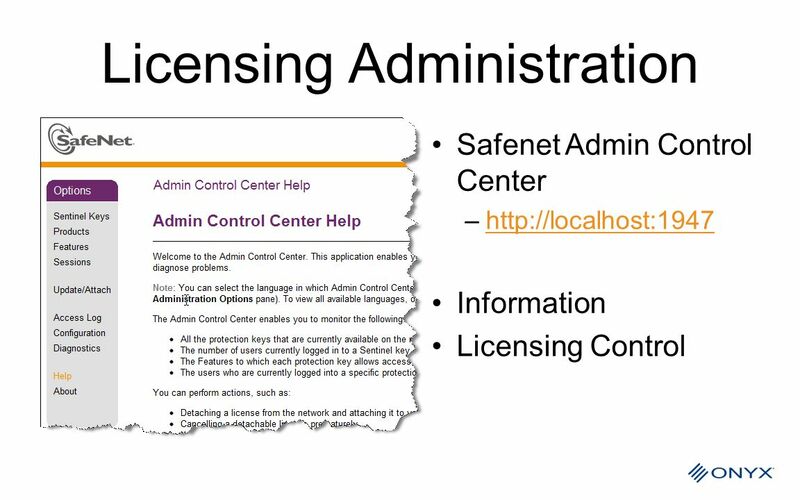 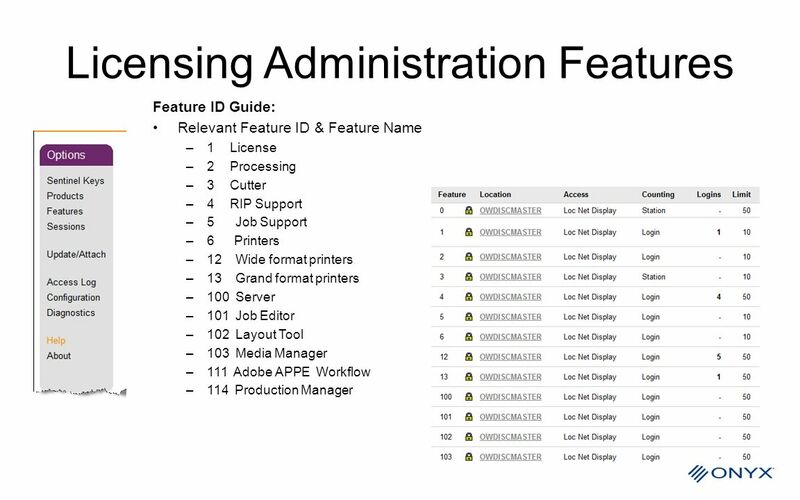 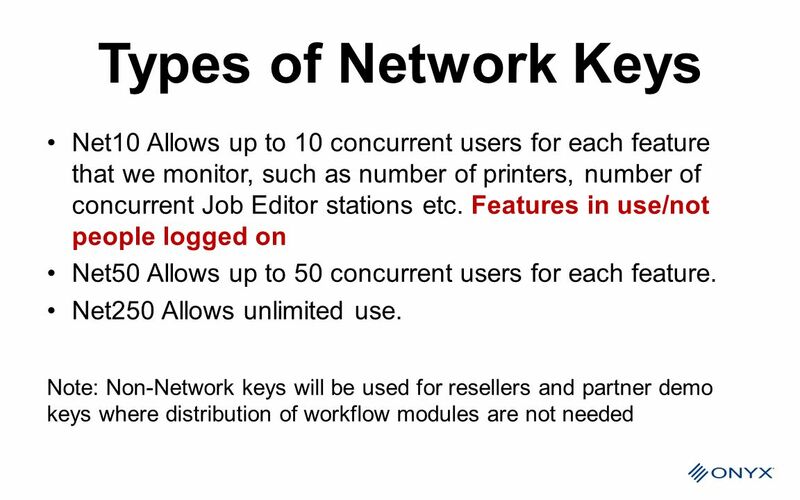 Clicking on Sentinel Keys and clicking on the Features button associated with the network key allows the user to view who is logged onto which features (a list of feature numbers with the feature name is given at the end of this document) and how many licenses he has checked out. 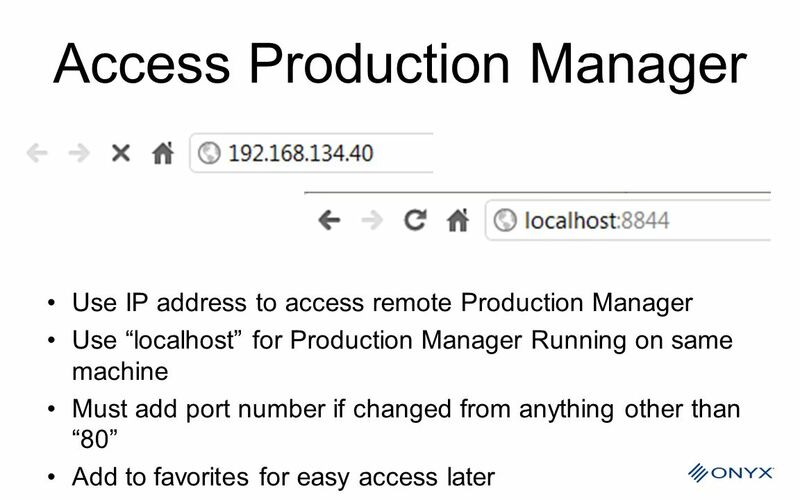 The administrator can “unlog” a user from a feature if that user is tying up a resource unnecessarily, i.e. 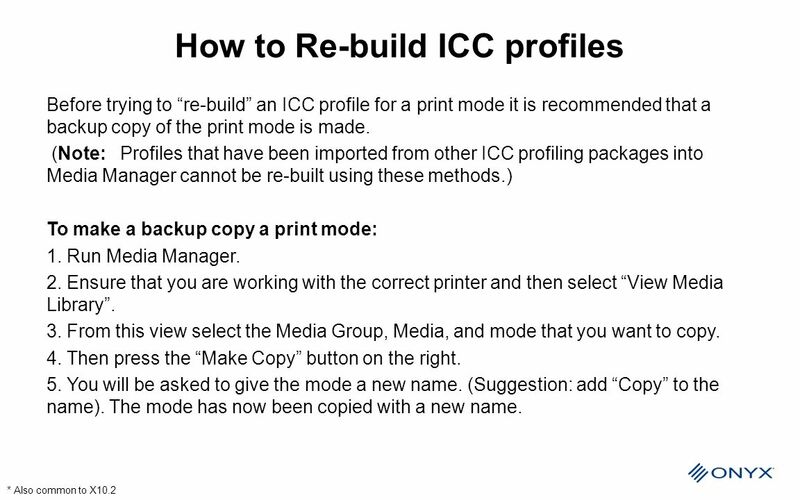 went home without logging off and not running a long print job. 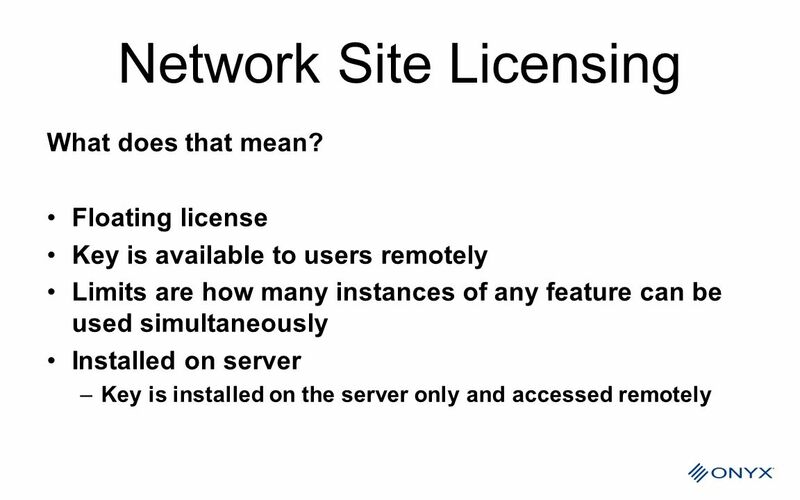 Another Possibility is that a user may request more licenses than are currently available on the key and he will be directed to reduce the number of requests. 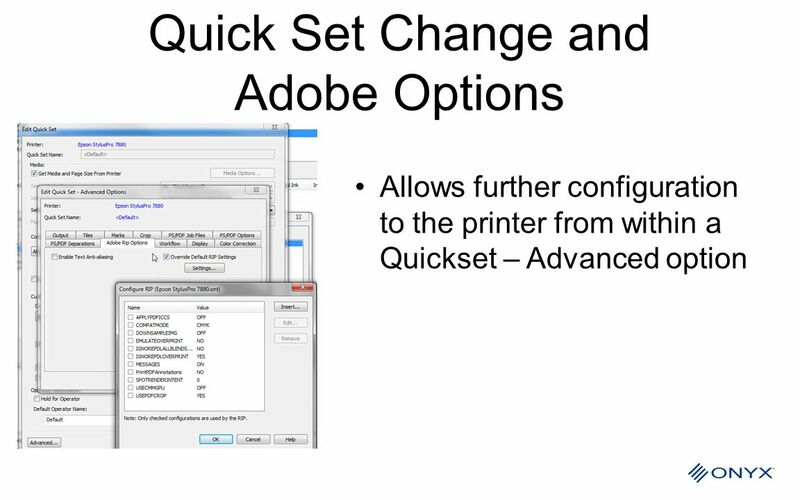 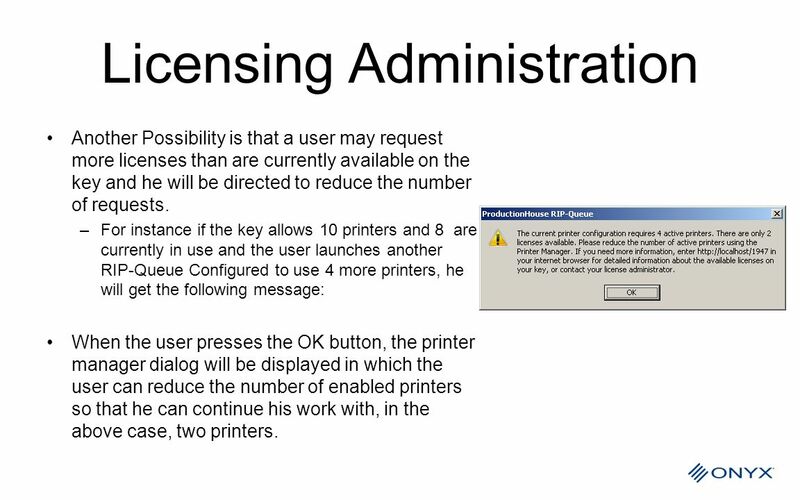 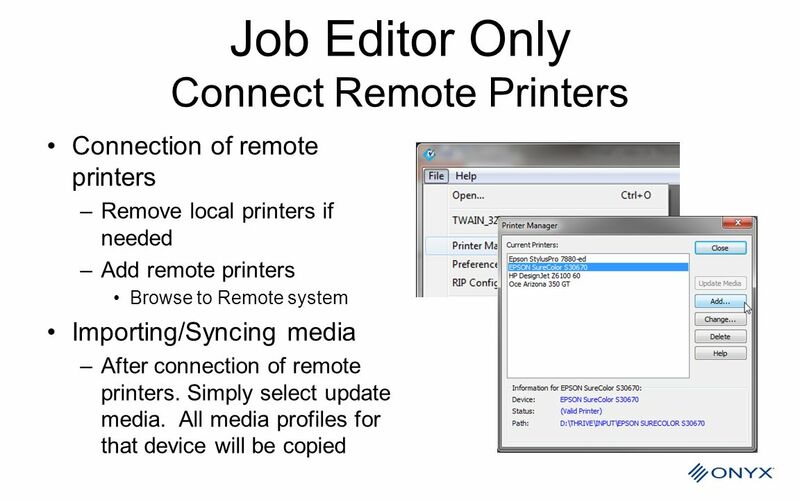 For instance if the key allows 10 printers and 8 are currently in use and the user launches another RIP-Queue Configured to use 4 more printers, he will get the following message: When the user presses the OK button, the printer manager dialog will be displayed in which the user can reduce the number of enabled printers so that he can continue his work with, in the above case, two printers. 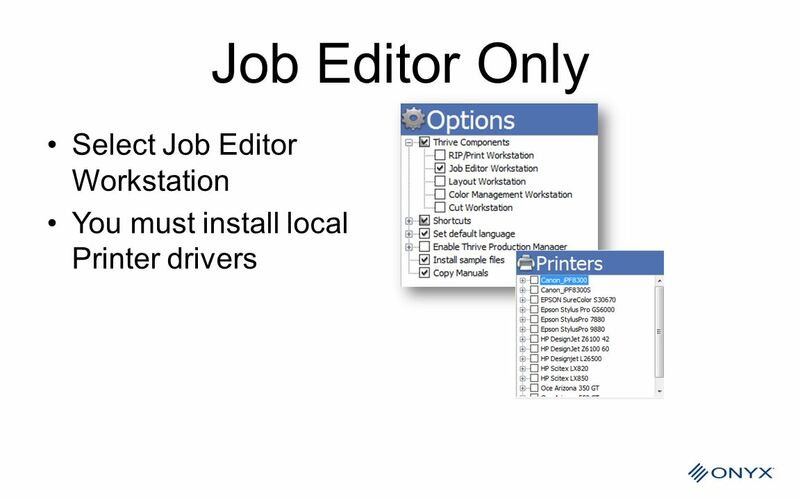 33 Job Editor Why the name change? 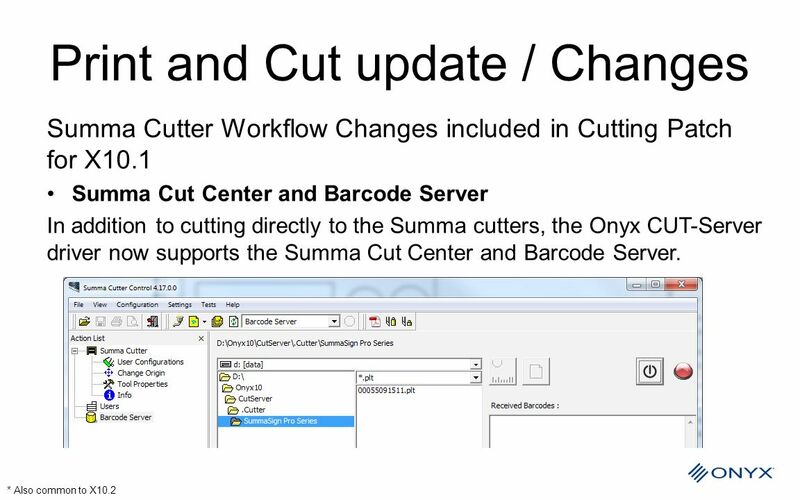 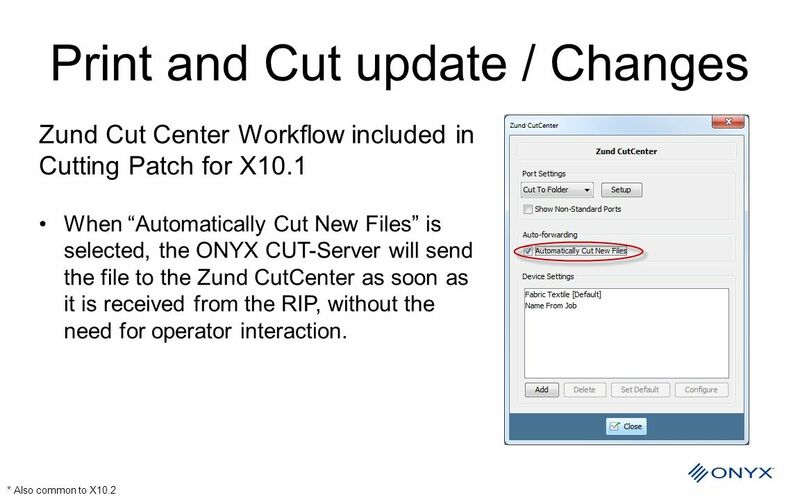 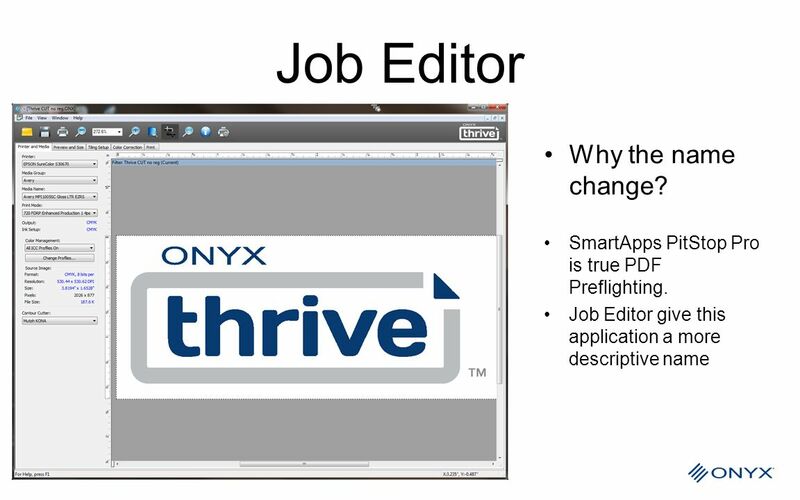 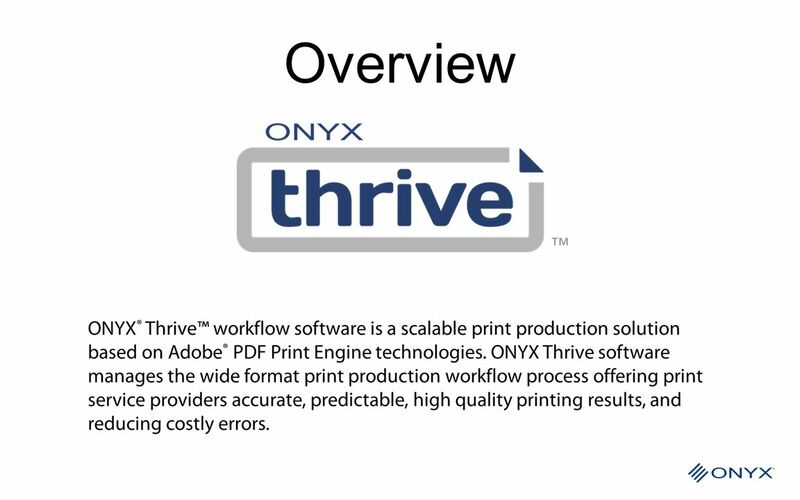 Download ppt "ONYX Thrive Technical Information"
MODULE 3: OS & APP LAYERS. 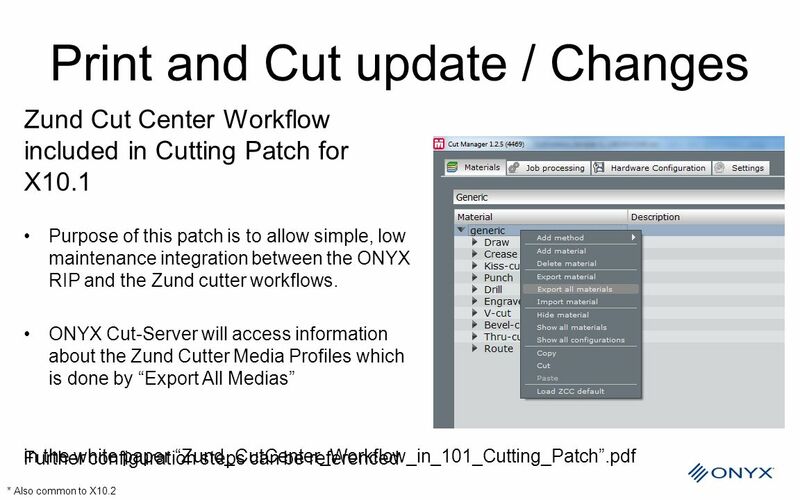 Agenda Preparing and importing a gold image Creating and understanding Install Machines Creating basic Application layers Understanding. 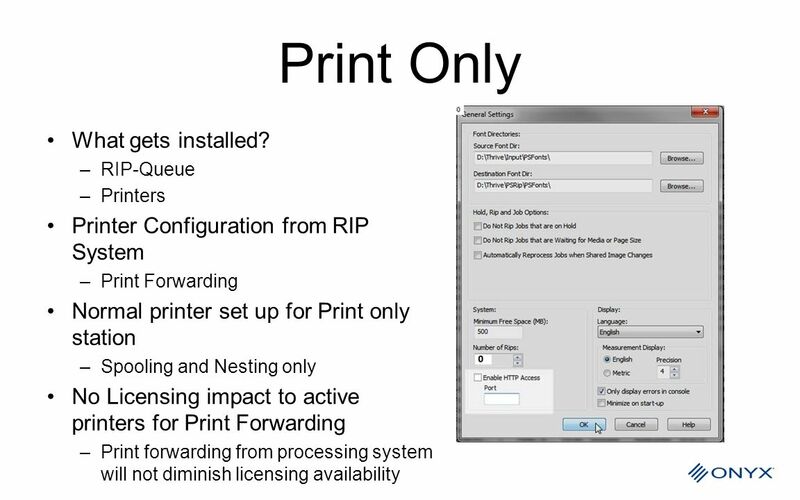 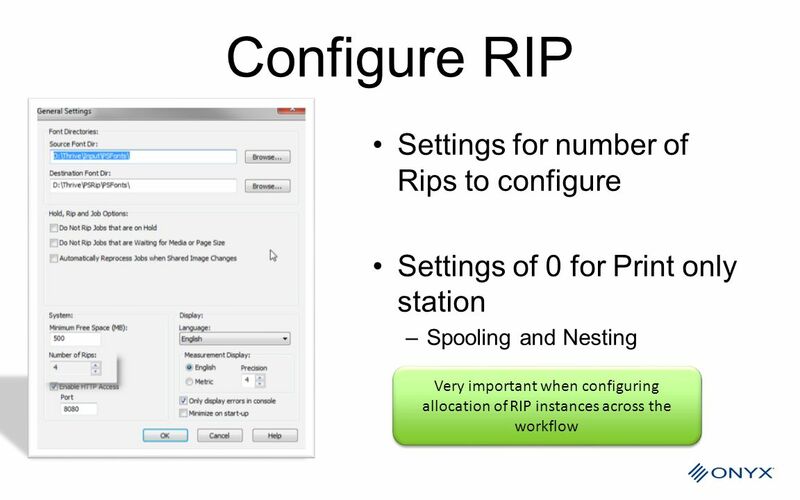 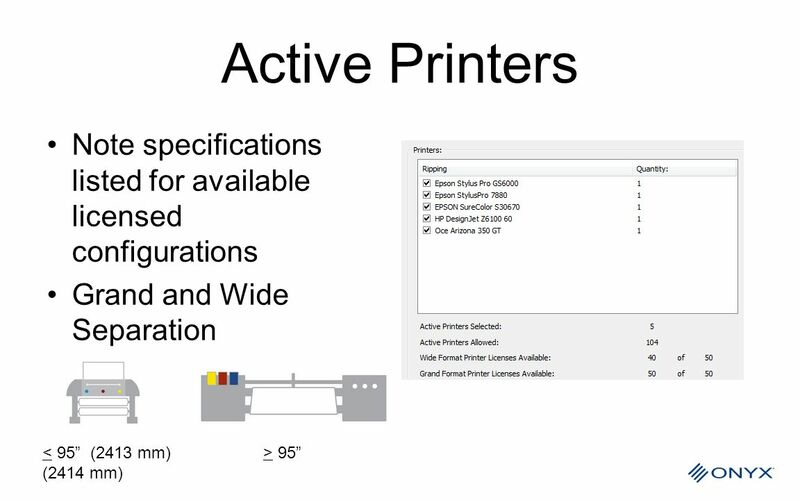 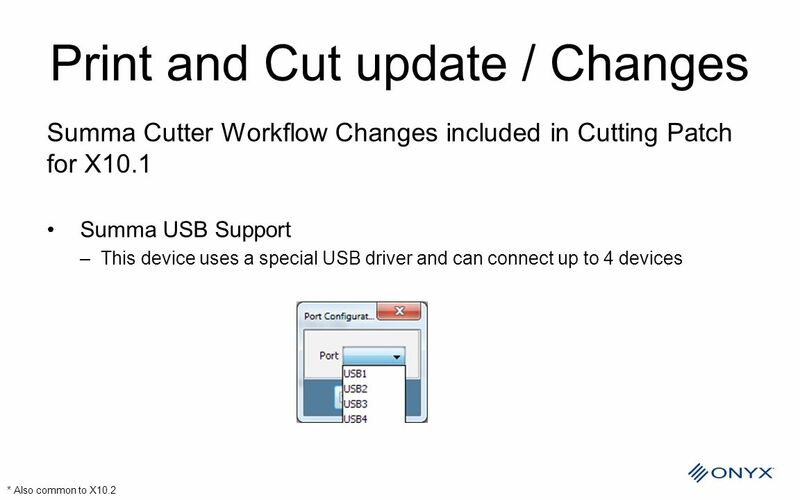 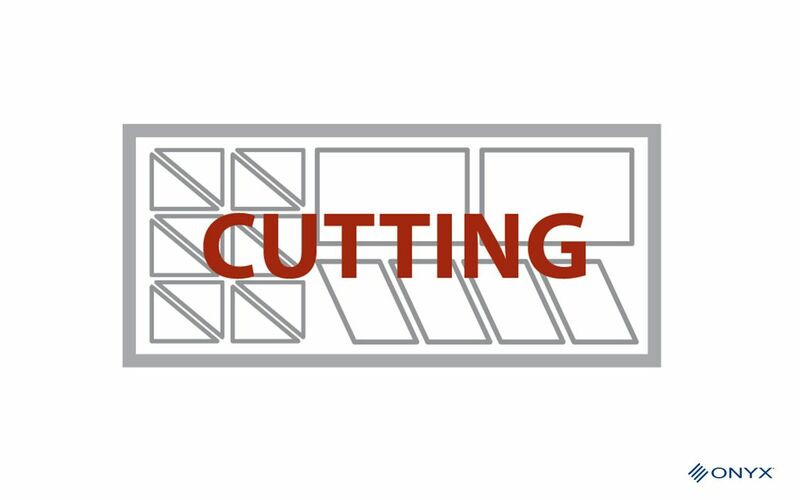 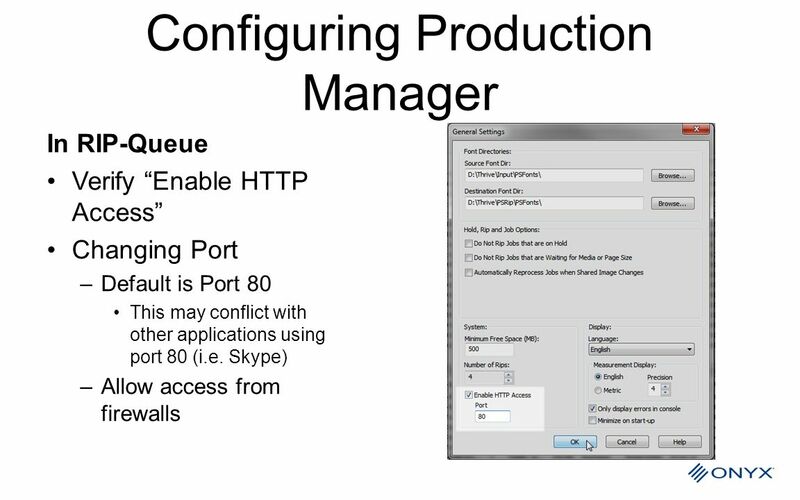 By Rashid Khan Lesson 7-Preparing for Output: Printer Configuration and Management.